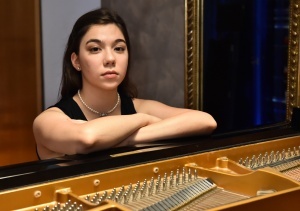 Budding young pianist Kira Frolu concludes the 2018 Romanian Series at St James’s Church Piccadilly with a concert featuring evergreens of the piano repertoire by Scarlatti, Busoni and Chopin and lesser known works by Romanian composers Constantin Silvestri and George Enescu. Newly enrolled at the prestigious Royal Academy of Music where she will study with prof. William Fong, Kira promises a recital to remember. 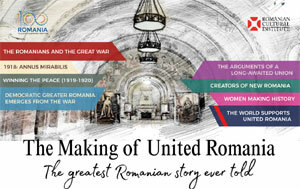 Do join us! 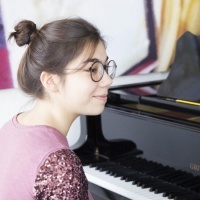 F. Busoni - Chamber Fantasy on Bizet's "Carmen"
Kira Frolu is the prizewinner of several international competitions including “Chords of Khortitsa” and “Vladimir Krainev” (Ukraine),“Maria Tjarri”(Cyprus), “Pianale” (Germany), “Jeunesses Musicales” (Romania), “Young Pianists of the North” (UK) and others. She started her musical training in Bucharest and continued in London, at the Purcell School for Young Musicians (2016-2018) and, starting September this year, at the Royal Academy of Music. Kira has already given solo recitals in many prestigious halls in London such as Wigmore Hall or Milton Court, and performed with Hertfordshire Schools Symphony Orchestra and Toruń Symphony Orchestra. Apart from studying and performing, she has also taken part in numerous piano masterclasses and academies, such as “Pianale”(Germany), “Paderewski Academy” (Poland), “Suolahti Music Festival” (Finland), “Arthur Rubinstein masterclass” (Marbella) and others. In the future, Kira hopes to become a renowned solo and chamber musician, while getting involved in education and helping new generations pursue their musical careers. This lunchtime concert is free and no ticket or booking is required.